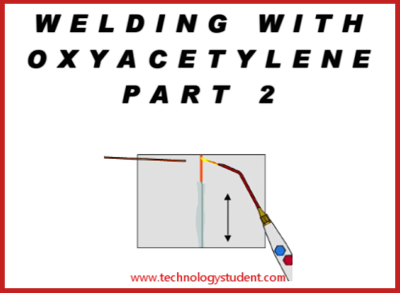 Oxyacetylene can be used to braze and to braze weld (bronze weld). These techniques are often confused, as they involve the use of the same equipment. Bronze filler rod is an alloy composed of copper and tin. Brass filler rod is also an alloy, composed of copper and zinc. Either rod can be used. The steel tube and steel plate have been heated to a dull red heat. The ‘bronze’ filler rod (coated with flux) is then introduced to the joint. It flows onto the two surfaces, forming a ‘fillet’ around the joint, joining the two surfaces. Braze / bronze welding provides a strong joint and is ideal of steel frames, where a certain amount of flexibility is required. The filler rod is broader than that used in brazing. When brazing, flux is applied to the joint, to prevent oxidation of the surfaces. The steel tube and plate are heated to bright red heat and the brazing rod (filler rod) applied to the joint. The end of the filler rod melts and flows around the joint, through capillary attraction. This gives a joint that looks like a ‘line’ of bronze. Brazing is ideal for manufacture of bicycle frames, as it does not ‘fracture’ as easily as steel welded joints.